Yesterday’s Office Snack of the Day, potato salad, sparked a discussion in the office on the merits of French potato salad, prepared with a vinaigrette, versus American potato salad, prepared with mayo and mustard. We concluded our versions of American potato salad were inferior to our mothers’ versions, but that the French versions (pommes de terre a l’huile) we made were delicious. M. adds bacon to her version. I do not. “It was a quick walk to Lipp’s and every place I passed that my stomach noticed as quickly as my eyes made the walk an added pleasure. There were few people in the brasserie and when I sat down on a bench against the wall with the mirror in the back and a table in front and the waiter asked if I wanted beer I asked for a distingue, the big glass mug that held a liter, and potato salad. 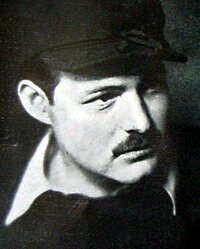 Good old Hemingway. Whenever I read him, I want to have a cocktail.